SURF ALONG EAST FACING SHORES WILL BE 2 TO 4 FEET THROUGH FRIDAY. The eyes looked with eagerness on the plain of Alele where the chief Kakuhihewa vacationed. It was beautiful from the flats of Alaala to the coast of Puunao and Kalaeohua, from the place of the drifting seaweed of Kuahine to the place of the lipoa seaweed of Oneawa. We saw the heiau of Leleiwi; pleasant Kapaa in the mist; Halekou, the pond of fat fish; Kaluapuhi; Waikolu, the famous pond of Kaelepulu where Makalei, the fish attracting stick stood. The necks of the birds appeared on the pond of Kawainui among the rushes. Kailua Beach Park lies at the south end of the beach. 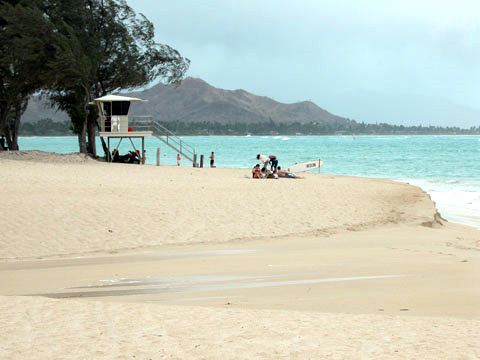 The 35-acre park, which includes a public boat ramp in the lee of Alala Point, has been the center of windsurfing on O’ahu since the sport was introduced in the 1970s. An area marked by buoys along the park’s shore is reserved for swimmers. Popoi’a Island, popularly known as Flat Island, is one quarter of a mile seaward of the boat ramp. Popoi’a means “rotten fish,” and may refer to offerings that were left at a former fishing shrine in the middle of the island. The tsunami of 1946 destroyed the remnants of the shrine. Landing is permitted on the island’s small sand beach, although Popoi’a is part of the Hawai’I State Seabird Sanctuary. A popular surf site known as Flat Island breaks on a shallow reef on the island’s south side.